If you're a first-time homebuyer in today's market, experts have a brief message for you: good luck. Traditionally, first-time homebuyers tend to be couples, in their mid- to early 30s with an established career and adequate savings to make the big purchase. But some of the faces making up this group now are a little older than in the past. "There is now an older group of first timers who couldn't buy before the housing burst because they were just getting established and prices were insanely high," says Keith Gumbinger, vice president of mortgage and consumer loan website HSH.com. "But then they also couldn't buy during the recession because they lost their job or had massive debt." He estimates that about 15 to 20 percent of the new-homebuyer market is made up of people over 35. 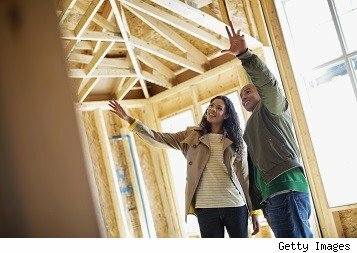 First-time buyers play a key role in the housing market's health and strength of the economy, but they're having a hard time finding room at the bargaining table and face unique challenges that those before them didn't face. "Because home prices fell so much after the housing bubble burst, there is stronger-than-usual investor activity. Inventory is below normal and mortgage credit is tight," says Jed Kolko, chief economist for Trulia.com. According the National Association of Realtors, first-time buyers made up 29 percent of home sales in June, down from 32 percent in the same period a year prior. "Adults that used to be buying houses are now living with their parents or with many roommates because they have no economic confidence, and that takes a toll on construction, which is key to the housing market," explains Kolko. Consumers' first house tends to be the starting point to larger purchases after they establish more equity and are able to move up to larger and more expensive homes. When this trading-up effect doesn't happen until later in life, it can stifle economic growth. "Buying a home used to be the second step," says Kolko. "It used to be: You rent first, and then buy. Now, you live in a basement, then rent, and then buy. That pushes a lot of spending to later in life, and the economy needs that spending." It's hard to fault would-be-homebuyers' lack of confidence. "These young adults have a lot of hurdles they have to overcome, they are still underemployed or work part time, so they don't have the job history or income strength to get a mortgage," says Gumbinger. "The ability to increase your income is slight in this marketplace of rising home prices." First-timers are also carrying around more student loan debt than past generations, which prevents them for qualifying for a mortgage. "Right now, the interest on student-loan debt is an average of $22,000-$25,000 ... so we are asking first-time homebuyers to first pay the equivalent of two cars before being able to buy a house," says Jed Smith, managing director for quantitative research for the National Association of Realtors. First-time buyers do face some obstacles, and experts advise them to either get in now or wait a year or two. "They either need to pull the trigger now and battle the low inventory and tight mortgage market and take advantage of the lower rates or wait a year, face higher home prices but have more inventory to choose from and have looser lending practices," says Kolko. He expects home prices to continue to rise, but not at the current 10 percent year-over-year pace. "Prices will hit the brakes, but that won't throw the market's recovery into reverse." For buyers ready to take the plunge now, they should expect to pony up a big offer. According to a recent survey from Trulia, 78 percent of young adults who plan to buy a home say they would use aggressive tactics to seal the deal, including making an offer above list price, paying seller's closing costs and removing contingencies. Financing has always been a struggle for first-timers, but current lending practices are especially tight for buyers because lenders' are too "shell-shocked," according to Smith. "We don't see standards loosening significantly in the near future. Hopefully (lenders) will readjust their portfolios to make them feel comfortable taking on a little more risk, but that's down the road." The attitude of potential first-timers has also shifted as memories of the recession continue to haunt them. "There is no doubt now is a great time to buy, but there is this fear of loss that is stopping them," says Gumbinger. "This is jumping in with both feet into the deep end; they watched friends and family lose their life savings, get removed from their homes and have to start all over, and for them, it's just not worth the risk and responsibility." Wanelo, Next Verb in Digital Dictionary?